If you’re short of time or inspiration for your home projects, our home styling services will bridge the gap between doing it yourself and contracting a costly interior designer or project manager. From a single room to a full home makeover, we’ll give you practical, professional advice and hands-on help to suit your needs and budget. It doesn’t have to be expensive; often a fresh approach to what you already have and a few well-chosen finishing touches can be enough to transform your home. Tell us your ideas and our expert and friendly team will work with you to achieve them, or we can suggest changes that you may not have thought of. And you don’t need to commit to a large-scale project – our home styling services are fully flexible, meaning that we can do as much or as little as you require. Some clients simply want a checklist that they can work from, others ask us to manage their whole project from start to finish. If you’re looking to sell your home, first impressions count. We’ll help you achieve the highest sale value possible by presenting your home at its very best. Our team will create a warm and inviting impression without incurring unnecessary cost. Book a consultation and we’ll assess your property through a buyer’s eyes, making note of any wear and tear that needs addressing. We can then organise the relevant assistance, such as plumbers, carpenters, or flooring and furniture suppliers. Finally, our home staging experts will add the finishing touches to make your home really stand out in estate agent photographs and viewings. If you own a rental property, the period between tenants can be a good opportunity to refresh it. An attractive and well-presented property will attract high-calibre tenants and allow you to maximise the return on your investment. Our decluttering and home styling services are perfect for landlords. We can assess all the little jobs that need fixing after general wear and tear, such as leaky taps, dirty carpets, cracked tiles, scuffed paint, or an untidy garden. We can then source local tradespeople and gather trusted quotes for your work. And if you’d like us to project manage the work and be on-site while it’s taking place then we can do that too. If your home, garden or even just one room is in need of an update we can present you with ideas for improvement and organise the work. Sometimes just a few simple tweaks can change the whole dynamic of a room, at very little cost. Maybe you have just finished an extension or room renovation and would like some style advice on paint colours or finishing touches. Hour Hands can help you with ideas, source items and style the finished room. A client asked us to reimagine, decorate and make-over her 9-year old daughter’s bedroom. The client had an eye for interior design herself but was short of time. She therefore wanted help to plan, source furniture and accessories, but take out the lengthy internet trawl. They were also due on holiday, and we had to put our ideas into practice while they were away. The grand unveiling was to be a complete and amazing surprise for their daughter when they returned home! After an initial hour-long meeting, we gathered ideas and inspiration for the room as well as its relevant dimensions. 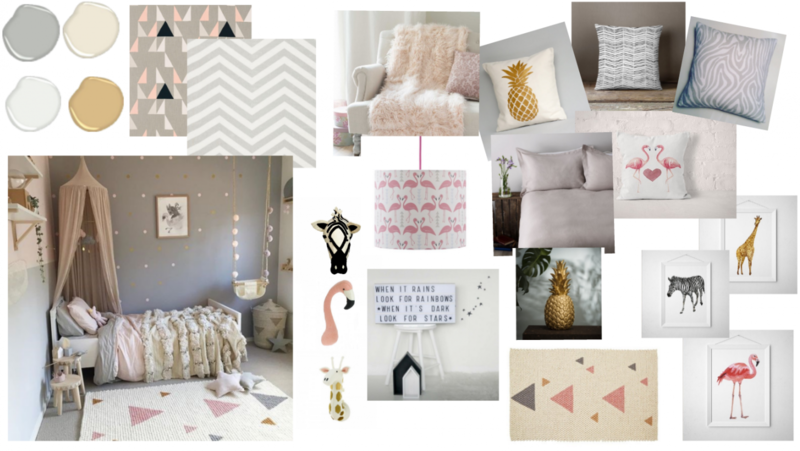 We channelled the 9-year old’s love of flamingos, giraffes and pineapples into a reinvented space that was sophisticated, but not too grown up, and was feminine, but not too girly or pink! This helped us to create a mood board that captured the colours and accessories suggested in the brief. We also provided a handy inventory outlining where all the suitable items could be purchased, and for what prices. Once the items were agreed and purchased a painter and decorator prepped the room. Hour Hands then arrived to dress and style. That 9-year old is still beaming right now!